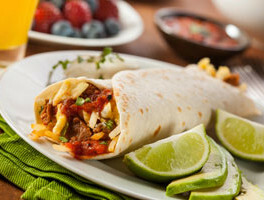 If you are tired of the same boring breakfast, try this satisfying and tasty burrito. You can experiment with different veggies in this recipe too. In a medium bowl, whisk together the eggs, egg whites, hot pepper sauce, black pepper, and cheese. Heat the margarine in a medium non-stick pan over medium heat. Add the ham and sauté for 2-3 minutes. Remove the ham from the pan. Add the onions and green peppers to the hot pan, and cook for about 5 minutes. Add the ham back to pan. Reduce the heat to low and add the eggs to pan. Gently stir the eggs with a spoon or spatula and continue lightly cooking over low heat until the eggs are cooked and set. Evenly divide the egg mixture into 4 servings. Spoon each portion of the egg mixture into a tortilla and top each with 1 tsp. salsa. Fold the tortilla to close.